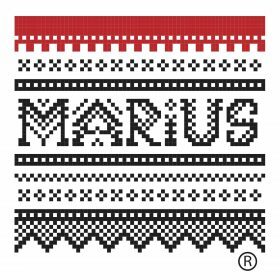 The Marius-sweater was designed in 1953 by Unn Søiland, and sold to Sandnes Wool factory in 1953 as a handknit-reciepe pattern. Today it is known as the bestselling and most knitted pattern in Norway. It is considered a Norwegian icon that says something about Norwegians’ love for the outdoors in the free Norwegian nature. The designer Unn Søiland made history by designing new patterns and used wool with bright colors, which was very unusual at the time, and this made “Norwegian sweaters” to great fashion, also abroad, – and “Norwegian sweaters” became an internationally popular concept.